Years ago when I needed a logo designed for Roundwood Press, I contacted Helen O’Brien in Ireland – a close friend since we were fourteen years old. Helen produced splendid celtic design artwork for years, and spent time working in California as an animator for Hanna-Barbera. “Here all is well.. school, activity runs, spending time with family, a little bit of teaching work, bit of golf!, bit of tennis, seeing friends and lots of running round the hills still to clear the mind. That’s what occupies me in general, plus looking after our guest – 15 year old Galician student who is doing a transition year in Pres Bray school. It all distracts me from my domestic goddess duties which I’m quite incapable of! I soon contacted Helen’s sister Denise, who lives in Spain, and her husband Carlos designed the Roundwood Press logo. The fact that the logo was designed by a relative of Helen’s, who has visited Ireland and the Wicklow Hills, I considered important for this website. Helen was a bright spark. She was not only an artist, but in her teens was a national tennis player for Ireland. She was an exploratory soul, and once visited me briefly in Colorado while traveling back after months spent living in Chile – inspiring me to visit that same country decades later. Another time we wandered around Covent Garden in London, where she laughed at how the bustle of the market mesmerized me (I had just returned from years living in rural Malawi). When I last saw Helen a few years ago for a brief lunch in Ireland, she decided to walk across a mile of fields separating her home from the pub where we met in the village of Delgany, because she always considered walking healthier than driving. On another occasion I visited Greystones in Ireland about a decade ago and met Helen walking up Trafalgar Street pushing a baby-stroller. She told me her son’s name was Lorcan. Because I was doing research for a book about Ireland at the time, I told Helen that Lorcan was the name of the great chieftain Brian Boru’s father – and that her son would no doubt grow up to bring pride to Ireland. Helen simply laughed with joy – as she always did. 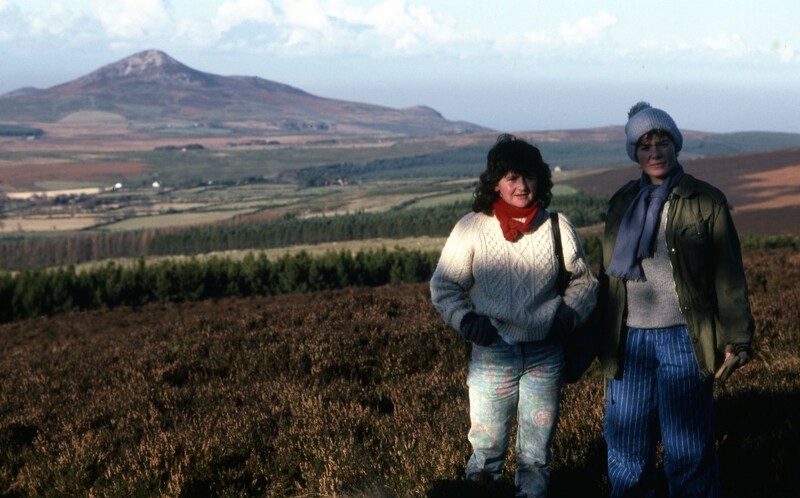 The photo above was taken during a hike we took on Djouce Mountain in County Wicklow – part of the Roundwood country she helped me to love and appreciate. She is survived by her husband (and a former classmate and friend of mine) Criostóir McLaughlin, and their son Lorcan, as well as her mother Nuala and siblings Denise and Cormac. We shall miss you Helen. that´s a lovely tribute to helen.